Sometimes food is just so cute and so simple and, more importantly -- so much FUN! 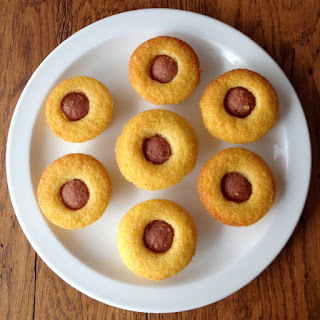 If you've seen them on Pinterest and found yourself remembering corn dogs at the state fair, then you need to know that these cute little corn dog muffins taste just like the deep-fried state fair dogs on a stick. No fuss, no muss and no vat of fat! I used a little box of my favorite fast and easy cornbread mix and spooned the batter into prepared mini muffin pans. 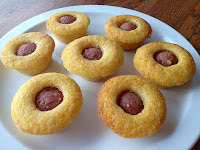 Next I sliced some hot dogs into 1-inch pieces and gently pressed the pieces into the muffin batter. Into the oven they went to bake for just a few minutes. Of course, your favorite homemade cornbread recipe should work just fine, but I might suggest adding just a spoonful of sugar to give the batter a more authentic fair flavor. Slather on a little mustard, or ketchup if you must, but make mine mustard, please. Ketchup is for french fries and mustard is for corn dogs. But ... follow all the rules and you will miss all the fun! Like the also perfect pairing of french fries and mayonnaise. For the whole state fair in February experience, you know what's for dessert, don't you -- Fiddlesticks, of course! Save gourmet for another day. Today is for food for fun and fun for food! Preheat oven and prepare muffin pans according to cornbread recipe or mix instructions. Spoon into muffin pan so each is about 1/2 - 2/3 full. Slice hot dogs into 1-inch pieces and place one into the center of each muffin. Bake according to directions, until slightly browned on top. Serve alone or with chili or soup.